Our key staff have undergone the prescribed training and are certified. We issue a Certificate of Compliance with every new installation. This is valid for 2 years. Should you require a C.O.C. please give us a call and we will gladly quote. Property owners with their own energizers are advised that a Certificate of Compliance (COC) is available on request to ensure that the electrified fencing system installed complies with new Government Regulations introduced on 1st December 2012. A Certificate of Compliance is mandatory when selling your property and is transferable, provided the certificate is less than two years old. Electrified fencing was originally developed in New Zealand for the primary use of farm animal movement and containment. Later the Security Industry improved on this technology developing a multi-strand wiring system fitted on to insulators and powered by an energizer to create intermittent electronic pulses through the wires. When touched it can deliver a substantial and most uncomfortable shock delivering up to 10,000 volts and sending criminals well on their way! Live Wire! Watch Ouch! Electrified fencing is powered by an Energizer - a transformer that converts low voltage power into higher voltage which is normally set between 7,000 and 11,000 volts. Live Wire uses the superior Nemtek Range of Energisers which have both proved to be robust and extremely reliable, backed up with a 2 YEAR GUARANTEE. Unlike the electric power in your home, the energiser powers the LIVE WIRES in “pulses”, on/off every second and therefore is termed a “non-lethal” electric fence. The LIVE WIRES when touched will give a really nasty shock but will not kill! The low amperage is measured in “joules”. Wall Height Minimum wall height of private property to be secured - 1.5 metres. Brackets Upright brackets may be used without any height restriction. Angled brackets Brackets can be angled at no more than 45 degrees out and are to be installed on the inside of the boundary wall. Neighbours It is not permissable to angle brackets into a neighbour’s property without their knowledge or consent. Hazard Electrified fences are to be installed and operated so that they cause no electrical hazard or entanglement to persons or animals. Barbed wire or razor wire These shall not be electrified by an energiser. Warning Signs Electric fencing installed along a public road or pathway shall be securely identified with YELLOW WARNING SIGNS (100 x 200cm) at intervals not exceeding 10 metres. All gates and access points to have warning signs. Electrified Gates To be capable of being opened/closed without the person receiving a shock. Live Wire uses SABS compliant energisers and stainless steel 316 marine grade wire for our electrified fence installations, which all conform to strict legislation as specified in the Government Gazette. 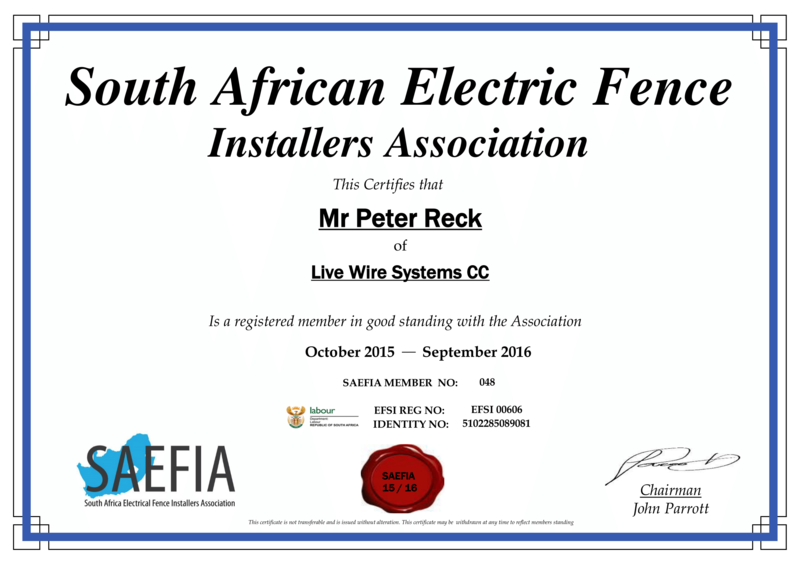 Live Wire electrified fence installations conform to all other controlling legislations such as the minimum installation height permissible and warning sign requirements pertaining to the erection of non-lethal electrified fencing. 1.6m SABS approved A grade earth spikes will be driven into the ground at intervals of approximately 75 meters. A minimum of 3 is regulatory as is Lighting Protection. All cabling between the fence and the energizer will be sleeved in 20mm PVC conduit piping.